C-reactive protein, or CRP, is produced by the liver as part of an inflammatory response. Your physician may order a CRP test if he suspects you have an inflammatory disease such as lupus or rheumatoid arthritis, or to determine if anti-inflammatory medication is working. The CRP test provides your doctor with very general information. Specific tests and procedures are necessary to diagnose the cause of high CRP levels. 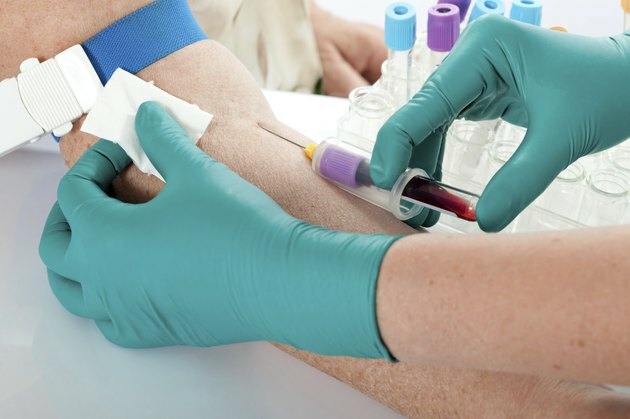 A simple blood draw is the only thing necessary to determine your CRP levels. The phlebotomist will swab the area on the inside of your elbow or back of the hand with an antiseptic solution. Next, he will insert a needle into a vein to draw blood into a vial. The blood is mixed with antiserum at the lab to isolate C-reactive protein. The standards for a normal test result vary by lab, but generally, no CRP is present in the blood for a negative test. If your levels of CRP are low, it doesn't mean that inflammation is absent. For unknown reasons, CRP levels may be normal in individuals with lupus or rheumatoid arthritis, according to "The New York Times Health Guide." A positive CRP test simply means that there is inflammation somewhere in the body. High CRP levels may be due to infection, inflammatory bowel disease, cancer, lupus, pneumonia, rheumatoid arthritis, tuberculosis, heart attack or connective tissue disease. A positive result may also be the result of something as innocuous as pregnancy or the use of oral contraceptives. Your physician may order a more specific test called a high-sensitivity C-reactive protein test, or hs-CRP, to determine your risk of heart disease. A high hs-CRP of 3 milligrams per liter or above indicates a serious risk of cardiovascular disease. An hs-CRP of 1 to 3 milligrams per liter constitutes an average risk, and an hs-CRP below 1 milligram per liter indicates a low risk of heart disease.